One of the worst thing about the dorms is not being able to use candles! Like ugh, I promise I'm not going to set my room on fire. There definitely are pros and cons! Its always best to make the most of it! Cooking for yourself would be a huge pro! It definitely is! Although cooking isn't my favorite, I definitely feel like I'm eating better than when I was just going to the dining hall! There are for sure pro and cons for dorm rooms, Eating better and possible having a pet and picking your owe room mate are big ones! Definitely! I think the choosing my own roommates was a huge one, even though I was picking my current roommate when I moved off campus, haha! Thanks so much for sharing this- I'm a rising senior in high school so I'll be hanging on to this! Thank you so much, have fun in senior year! I'm living in an on-campus apartment this year because I didn't want to worry about sub-leasing when I go abroad in the spring. I need to look into living off-campus for senior year because it's so much cheaper! I'm definitely going to keep these pros & cons in mind when I do. That makes total sense! Have so much fun studying abroad!! And thank you so much, hope these tips help you if you look off campus for housing! I lived on campus for two years and off campus for two years. I definitely liked being able to decorate but living off campus made it much easier (and more compelling) to skip class. For me, living on campus gave me much more of a college experience and if I could go back I would live on campus all four years! That's exactly what I'm doing. And I 100% agree on the skipping class thing, especially if you only have one class that day. Very tempting to just not go! Thanks so much Cristina! I love being able to cook my own meals and prefer off campus as well! I've never lived on campus, but I've had friends on campus and have had to pick them up more than once so they could stay with me due to campus issues. I don't know if it was just the university or bad roommates but I'll take off campus living!! Yeah I've had some friends who have had to stay the night (even in my dorm) because of bad roommates! Sometimes you just don't luck out. These are super valid pros and cons, Sami! This will be my second year living off campus (I only lived on my freshman year), and the permanency that you brought up is huge for me. I love that I can just stay in one place, and I love having my own non-school space. It definitely is harder to be social this way, though, because it's so easy to turn into a hermit (A night of Netflix-bingeing and Oreos in a non-dorm? Uh, yes) when you only have to be at school for class! Permanency is a huge deal for me (and my parents, ha!) since I always have so much stuff to move and love to really decorate. I've always been a little more of a homebody, but yes living off campus makes it so much easier to cave in to those Netflix nights at home! Oh that's interesting! We have dorm-style apartments at our school that had kitchens, but you can't live in those until after freshman year. I wish I lived in a sorority house!! My campus doesn't have greek housing which is both a positive and a negative in itself. On campus is definitely fun, and I have so many great memories in the dorms! There are so many pros and cons, and each person is so different! I agree! It's definitely up to the preferences of each person! Great post, lovely lady! I agree with your point about permanence and being able to really decorate and make the place your own. Keep up the good work here and live unstoppable! 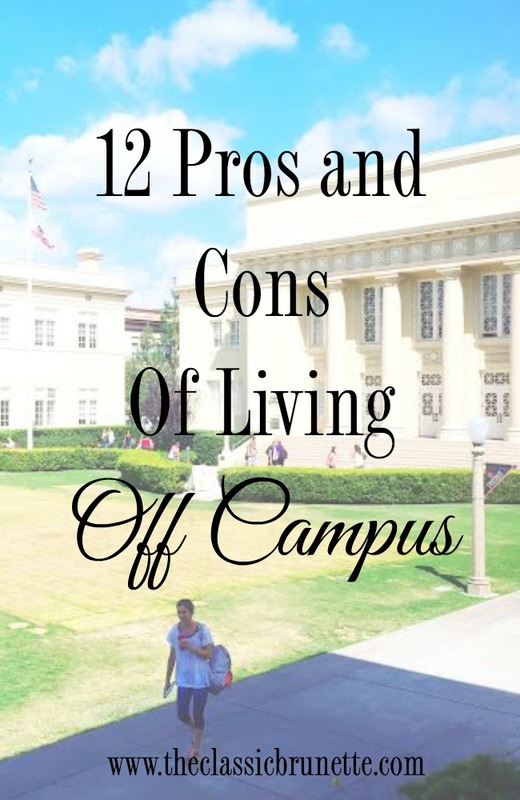 What a great list of pros and cons! I opted to live on campus all four years. However, I was extremely lucky because my last two years I was able to live in an apartment complex that my school just built, which was absolutely beautiful and spacious. If it weren't for the new apartment building, I probably would have opted to live off campus. Oh that sounds awesome! I lived in an on campus dorm-style apartment my sophomore year that was pretty nice, but it still felt too much like a dorm, and I wanted something more home-like! I lived off campus all throughout college--actually, I lived with my grandparents for the first two years and with my husband for the second two years. Being off campus definitely impacts your social life, though there are non-dorm-related ways to make friends, too. For me, the biggest benefit was the money savings, since my grandparents let me live with them for free. I had a car, so transportation wasn't a problem. Yes, money was a huge factor in my decision to move off campus! That's so fun that you got to live with your grandparents and husband! I have a car too since my college town doesn't have the best public transportation, so it was a pretty easy decision! This is a great list! I lived on campus all through college, but most of my friends chose to live off campus senior year! Thanks Kristin! I don't think I only know of one or two people who have lived on campus all 4 years, but that may be unique to my school! I agree that I found good and bad in living off campus, it is easy to get to class on time haha. Yes, I've almost been late to class a few times since moving off campus because I've had to find parking! Something I didn't have to worry about with on campus housing. I totally agree that there are pros and cons. I think it is important for freshmen to live on campus so that they can meet people and learn the campus. I got really lucky in that my university had on campus apartments that were kind of isolated from the rest of campus so it felt off campus. I enjoyed many of the pros you mentioned and none of the cons! I lived off campus and definitely enjoyed it, but OU was a lot closer than most campuses! SO funny. I've never lived on campus, so I have no idea about all the pesky dorm rules. But I can totally relate to the non-convent life of off campus living! The struggle is real sometimes!